1968 was a year that tested Stax Records, the wellspring of Memphis Soul, to its soul. The label emerged victorious, but the story of its three-pronged existential crisis and how the company and its key personnel responded is an epic chapter in music-industry history. To mark the 50th anniversary of that tumultuous year, the Craft Recordings division of Stax’s current owner, Concord Music Group, collected every song released on a 45rpm single in 1968, sequenced them in release-date order and packaged them in a hardcover book with a well-written and informative historical context essay by Andria Lisle and Robert Gordon, and a Stax-specific history by Steve Greenberg. A perfect storm of crises hit Stax and its employees, starting with the death of the label’s biggest star, Otis Redding, in a December 10, 1967 airplane crash. Also killed were the majority of Redding’s backing band and up-and-coming Stax stars, the Mar-Keys. Next came the end of Stax’s relationship with Atlantic Records, the NYC-based label that had launched national distribution and fame for many of Stax’s artists. And then, on April 4, 1968, Dr. Martin Luther King was assassinated at Memphis’s Lorraine Motel, throwing race relations in Memphis and America into chaos and deeply affecting musicians and executives at Stax. Several Stax people, including label Executive VP (and eventual President) Al Bell, had personal ties to Dr. King and his movement. And, the Lorraine Motel was a popular hangout for Stax musicians; like the label’s own offices and studio, the motel was an oasis of integration in segregated Memphis. On the business end of things, losing Otis Redding and then losing the relationship with Atlantic would have crushed most regional record companies. Atlantic also took ownership of most of Stax’s back-catalog, leaving the label poached of content and without national distribution. Al Bell’s reaction was to double down and spend the phase-out period with Atlantic recording new material at a frenetic pace. He opened up Stax’s inward-focused “family” culture—sometimes for better, sometimes for worse—and expanded Stax’s production reach to Detroit, New York and beyond. At the same time, the in-house teams of Booker T. & the M.G.’s, Isaac Hayes/David Porter and a reconstituted Mar-Keys worked on their own material and producing others’ recordings. All of this resulted in a phoenix-like resurgence of Stax, beginning with the flurry of new singles in 1968 and culminating in early 1969 with the “Soul Explosion,” an event marking the release of 29 new LP titles, including Hayes’ now classic Hot Buttered Soul and 30 new singles. Along the way, the label spent 1968 releasing new material at a frenetic pace, and not just in the soul genre. Bell began the process of expanding Stax into the pop and rock marketplaces, including early releases from Delaney & Bonnie and Bobby Whitlock (who gained fame later as a member of Derek and the Dominoes). 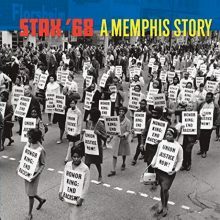 But by far the most profound event in Memphis, and at Stax, in 1968 was Dr. King’s assassination. As documented in the essay by Lisle and Gordon, Memphis was already a powder keg, with an on-going sanitation workers strike inflaming racial tensions between the mostly black workers and the white city government and police. Dr. King came to Memphis to march with the workers, and his killing by a white man, James Earl Ray, set off riots in Memphis and beyond. At Stax, tensions arose between black and white musicians, including men and women who had worked together for years and considered each other close friends. The solution from management, label President and majority owner Jim Stewart and Executive VP Al Bell, was to work hard and save the company, at all costs. The result was keeping the company together and thriving, although some of the fissures that emerged in 1968 marked the beginning of the end for Stax. In many ways, the Stax “family” grew into full adulthood, quickly and under fire, in 1968. 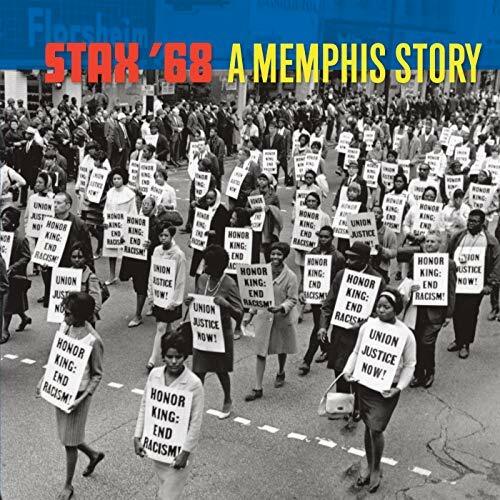 Within that context, Stax ’68 – A Memphis Story is a unique product. It’s really two things: a well-written and lavishly illustrated hardcover book telling the story of place and time, with many first-person accounts of events that still reverberate in America; and it’s a damn good musical anthology. The chronological presentation works because it documents the growing variety of Stax’s offerings, and shows Stewart and Bell willing to throw many darts at the proverbial wall to see which would stick. Greenberg’s essay refers specifically to the musical content, so it’s easy to listen along as one digests the context and impact of various songs. And of course, a lot of stone classics hit the airwaves and jukeboxes that year. A nice touch from compilation producer Joe McEwen and mastering engineer Paul Blakemore was to use the original single mixes of these songs, which usually means a high-impact monophonic presentation aimed to stand out on AM radios and in jukeboxes. As is the case with most Motown material of the era, Stax’s brand of soul (and other) music just sounds better this way. When 1968 wound down, the Stax release pipeline was full and loaded for the upcoming “Soul Explosion.” The company celebrated with a Christmas party at Jim Stewart’s house. Greenberg’s essay ends with a funny story from that party, a light touch to end the story of a very heavy year. This entry was posted in Rhythm & Blues, Soul, Funk and tagged CD review, Craft Recordings, Soul, Stax, Stax '68 - A Memphis Story, Tom Fine by aaamc. Bookmark the permalink.